The RC48C ground-fault ground-continuity monitor is used to monitor the residual current in high-resistance grounded installations. The maximum ground fault current in these installations is limited by a neutral grounding resistor to 5 A, 15 A or 25 A. It is particularly suitable for trailing cable protection. Trailing cables are very susceptible to environmental damage and therefore they need special attention. This is where BENDER comes in. Monitoring the grounding conductor for low resistance, high resistance and shorted. If a limiting value is exceeded, a relay with two voltage free changeover contacts will be activated. 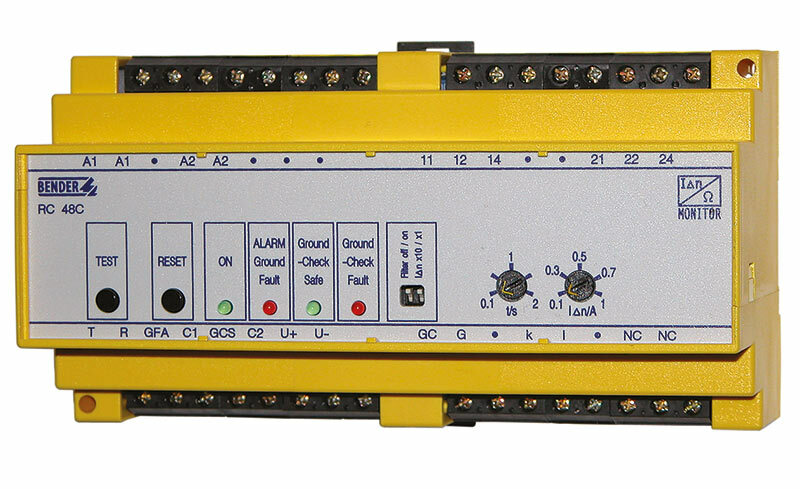 Alarm messages of the RC48C ground-fault ground-continuity monitor can also be displayed on a remote RI2000GC alarm indicator and operator panel.